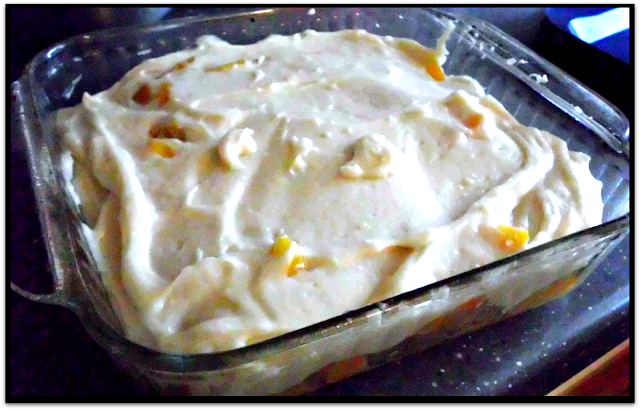 Recipe: Mom's Peach Cobbler | The Food Hussy! My Mom's peach cobbler is the most perfect dessert! It's warm and sweet, crunchy and juicy! 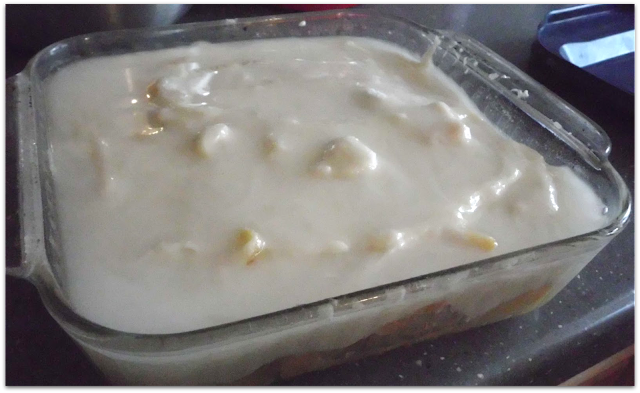 She provided me with her fruit cobbler recipe - it's been my favorite since childhood. She says that it came from our Grandma Grace whose parents brought this from the wagon train. My only question on this story is that I thought my great-grandparents were from Germany. Hmmmm - is my Mom pulling my leg? I choose to believe her...shhhh! First cream the butter & sugar - obviously works best with softened butter. Then add the flour, salt, baking powder & milk and mix some more. You can use canned, frozen or fresh fruit. Typically I use frozen but I didn't have time to wait for them to thaw so I went with canned. 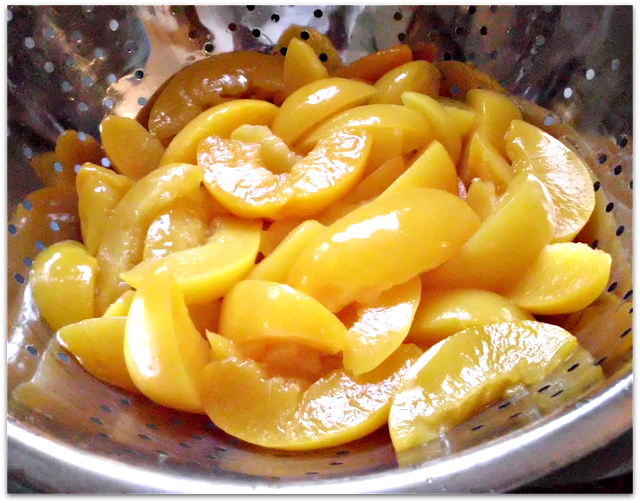 Drain 4 cups of fruit (drain them really well) and put them in a baking dish. I usually use square. 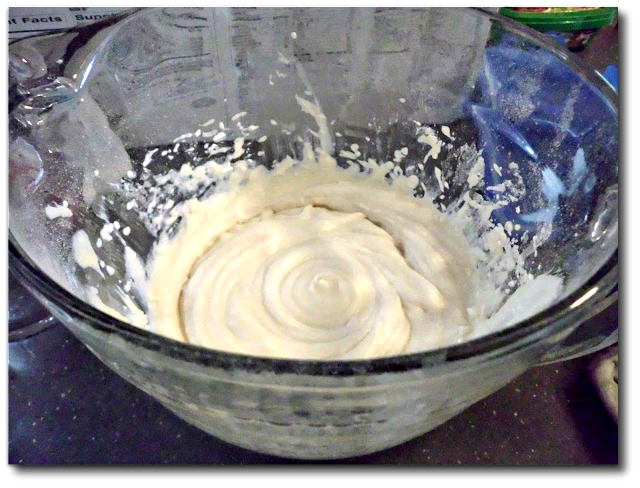 Then spread your batter on top of the fruit - make sure it covers all of the fruit. Mix the sugar, cornstarch and salt in a measuring cup and then sprinkle it all over the batter. Very important to cover every nook and cranny! The secret ingredient - BOILING WATER! Most people think I'm crazy when I mention this - but it's the key! 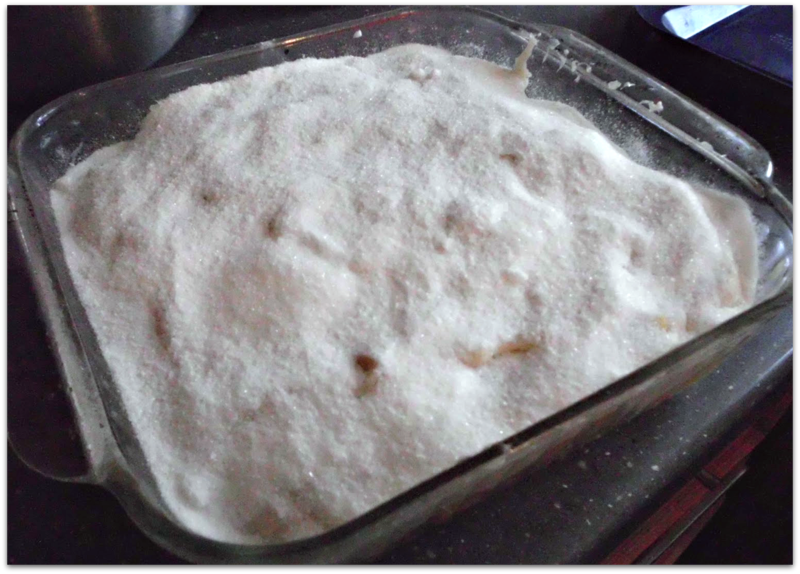 Pour 1/4 cup over the sugar - be sure you get every bit of sugar dampened with the water. Don't spread it though - just pour very slowly to make sure it all gets covered. Voila! 45 minutes later - deliciousness in a pan! The best part is the top is crunchy and cracks with the sugar/water. It's so delicious! This is by far the best cobbler I've ever eaten - and it's great that I can make it myself. And it's a dessert with no eggs! It's my go-to for potlucks... I highly recommend you try this ASAP! You won't be sorry - especially if you have some vanilla ice cream on the side. 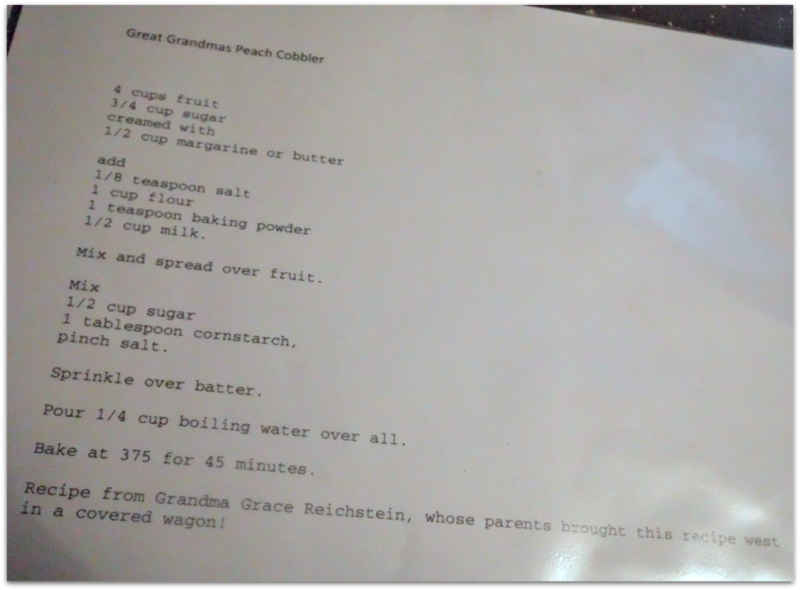 My Mom's famous peach cobbler - she says it originated on the wagon train. Do you believe that? I'm trying this tonight for a potluck tomorrow...if it last that long. It looks yummy. Looks just yummy! Am trying it out this afternoon; will comment again later - AFTER the kids have tried it. Looks delicious!I found you from the foodie blog roll and I'd love to guide Foodista readers to your site. I hope you could add this peach widget at the end of this post so we could add you in our list of food bloggers who blogged about recipes for peaches,thanks! Looks a lot like the recipe I have (from my great gramma) for Blueberry Buckle. It is wonderful ala mode :) This is a the first time I have see another recipe like it. I never even imagined using anything other than blueberries. What size pan do you use for this recipe? So, my parents were from Georgia and of course Georgia peaches were the best. Now my children live in Austin and Texas is equally proud of their peaches! 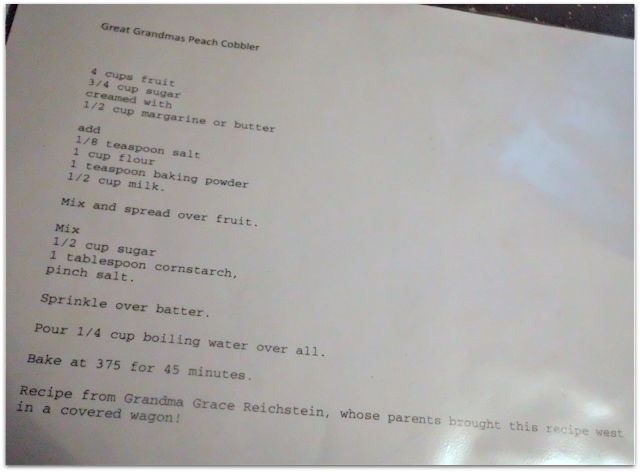 Now that I live here too, I made your cobbler with Texas peaches and it was fabulous. It was devoured in one sitting which is high praise indeed! Yes!!! I need to make a batch again - I love it so much! Have you ever doubled the recipe? Do you use a 9x13 pan or something larger? An 8x8 just doesn't cut it in our house, my family loves this!! I made it with frozen tart cherries and it was amazing. I would just use a larger pan - yes 9x13 would work. just make sure the batter thickness doesn't get too thin or too thick so you still get a bite with each bite of fruit! And yes - I have some blueberries in the freezer begging to be used! Hahaha - thanks!!! Glad you love it! 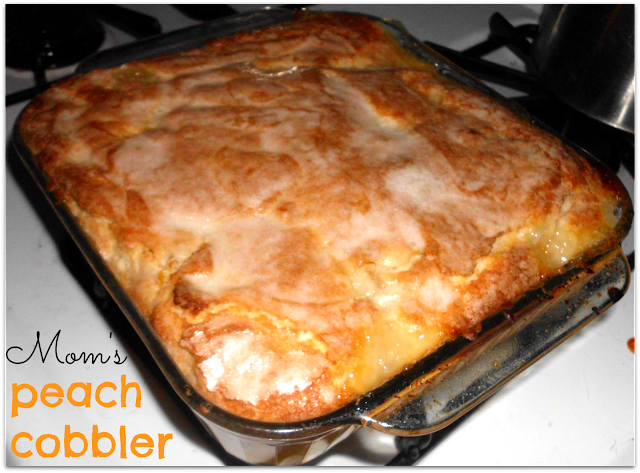 I made this cobbler today and OH MY is it good. I had some frozen fruit in my freezer I needed to use I had a few peaches and some mixed fruit, blueberries,strawberries, peaches and mango. I did pick out some of the mango and strawberries for the kids to eat, but, WOW I have to say I was not disappointed at all. It is very good.